Fly from London via Dublin to Chicago with Aer Lingus and explore the sights and sounds of one of the largest cities in the United States. Chicago is the largest city in the Midwest and blends influences from around the world. It has all of the big city attractions mixed with the more relaxed attitude and friendly people of the Midwest. Grab yourself a cheap flight to Chicago and discover how easy it is to travel to North America with Aer Lingus. Connect in Dublin where you can pre-clear U.S. immigration before boarding your flight - that means you can grab your bags and go when you land in Chicago! Chicago is unique in that it is a thriving, bustling metropolitan area that manages to feel homey at the same time. The ethnic diversity, multi-cultural neighbourhoods, and close proximity of these neighbourhoods make Chicago a true melting pot. The main tourist areas of Chicago are very close together, making it an easy city to explore. 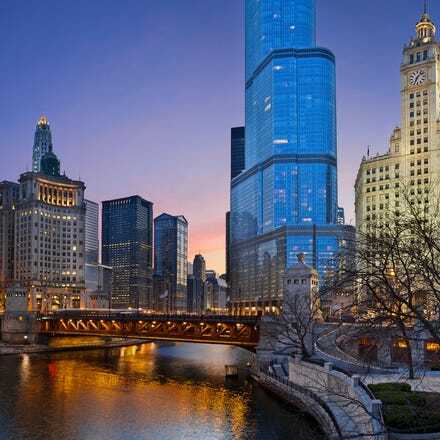 A leisurely walk, a short bus or taxi ride, or even a boat tour will expose you to the famous museums, breathtaking architecture, exclusive shops, world class festivals, delectable restaurants, and all else that Chicago has to offer. All Aer Lingus flights to Chicago arrive at O'Hare International Airport (ORD), which is located approximately 18 miles (30 km) northwest of the city centre. The Blue Line train takes passengers to and from O’Hare and downtown Chicago and runs 24 hours a day. Taxis take about 20-30 minutes to get to the city centre. Chicago has an excellent system of trains, buses and a commuter rail. Pay in cash on the bus and in exact change. Transit cards may be purchased at selected outlets and eliminates the hassle of needing exact change. You may also call and get exact directions on public transport to and from any destination in the city. RTA Travel Information service is available seven days a week, including holidays, 04.45-1.00 for travel information on CTA, PACE, and Metra.